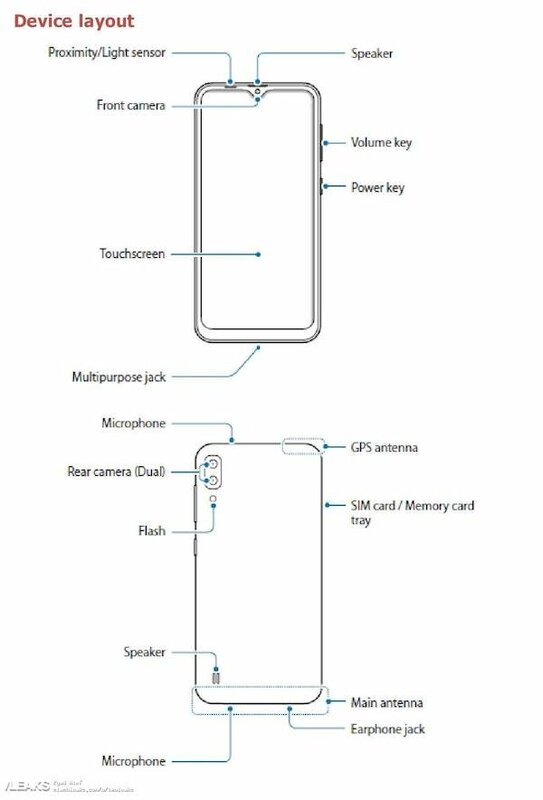 Just a few hours back we reported about the hardware specifications of the upcoming Samsung Galaxy M20 series, thanks to the official user manual of the device. Apart from Samsung Galaxy M20, two other smartphones i.e. Galaxy M10 and Galaxy M30 are also rumoured to be launched on January 28. Out of these two, hardware specifications of Samsung Galaxy M10 have also surfaced, thanks to the user manual getting leaked. Based on the user manual, Samsung Galaxy M10 sports a 6.2 inch LCD (HD+) Display having a resolution of 1520 x 720 pixels and runs on Android 8.1 (oreo) based operating system. Earlier leaks indicate that it is powered by Exynos 7870 SoC and comes with 2GB/3GB of RAM. In terms of camera, it features a dual camera module at rear consisting of 13MP primary sensor & 5MP secondary sensor while there is an 8MP shooter at the front for selfies and video calls. These are the same camera sensors that are rumoured to feature on Galaxy M20 and if this leak is correct, then it means that both M10 and M20 features the same set of dual camera sensors at the rear. The only distinction is the front shooter with Galaxy M10 featuring only the 5MP sensor instead of the 8MP sensor in Galaxy M20. The phone is backed by 3400 mAh battery. There is no mention of fast charging support though Galaxy M20 is confirmed to come with fast charging support. Galaxy M10 Price in India? The Galaxy M series India launch date is set for January 28th, and the phones will be sold exclusively on Amazon & Samsung e-stores. The Galaxy M prices are said to be from less than Rs. 10,000 to Rs. 20,000. Stay tuned at Androidpure and We will keep you updated.